Nobody offers better service, restoration, or collision repairs for all kinds of trucks and equipment. Diversified has the expertise to inspect your equipment and make it ready to safely haul the next load. Your trucks and equipment are your livelihood and should only be handled by skilled professionals who have the proper knowledge, experience and technology to get your vehicle back to its factory specifications. Our certified technicians have years of experience in collision repairs. We provide them with the best tools and equipment to make your repairs quickly and correctly. Take advantage of Diversified’s swing hood program that allows you to use one of our hoods while yours is being repaired. This keeps you on the road working while we are working for you! 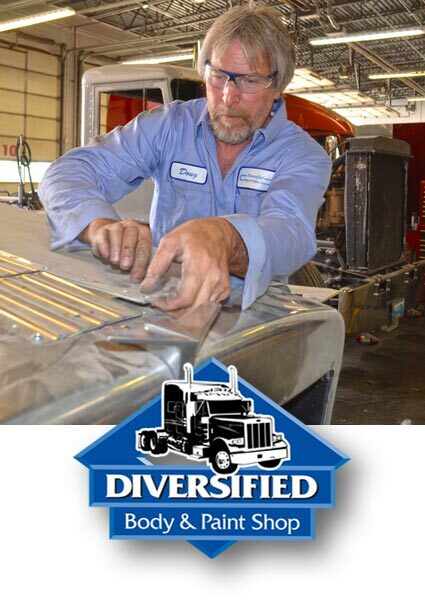 Diversified is a full-service truck collision repair company with a state-of-the-art facility and qualified experts who get the job done right. Our truck body shop is equipped with three large paint booths and repair machinery suitable to handle any size body repairs including the frame for commercial vehicles such as semi-tractor trailers, box trucks, flat beds, tow trucks, and more.